火焰山Huoyan Shan (Flaming Mountains) is a strip of about 100 kilometer long by 10 kilometer wide by 500 meter high red sandstone hills that runs east and west across the center of the 吐鲁番盆地Tulufan Depression (Tarim Basin). 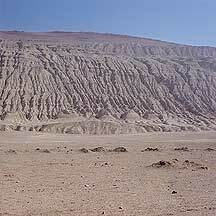 Eons ago, collisions among landmasses created the Tarim Basin and eventually further motions caused a distortion along a fault line that ran across its middle. 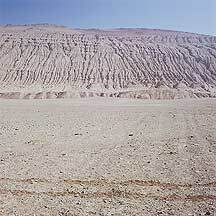 This distortion is the Flaming Mountains. In ancient times it had been called 赤石山(Red Rocky Mountains), and the local Uygurs (Uyghurs) called it 克孜勒塔格, which means the Red Mountains. Because of its numerous deep gullies running down its slopes, and combine with its red color and the rising hot air of the desert, so from a distance and at certain combination of the factors it has the phenomenal appearance of a huge wall of fire. 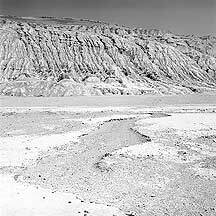 The mountains are a tiny part of the eastern tail end of the 天山Tian Shan (Heavenly Mountains) range on the northern rim of the 塔克拉玛干沙漠Taklamakan Desert; but unlike much of the large snow-capped peaks, these hot red hills are eroded and barren and within its immediate areas, nothing grows. Tulufan is the hottest spot in China. 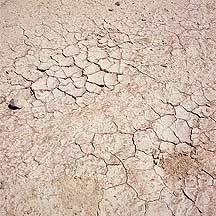 Locationing near the center of the Tulufan Basin, the floor of the mountain areas are dried up and cracked. 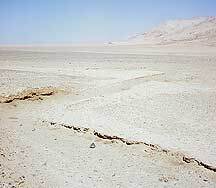 The extreme hot climate here caused numerous cracks on the ground. So hot that I could not stand on both legs for too long. In the foreground is the famous cudgel of 孙悟空Sun Wukong, the rebellious, and very unconventional, lord of the monkeys. The cudgel was also modelled as a thermometer, but I believe it was not a working one. The unusual mountain is by the national highway. 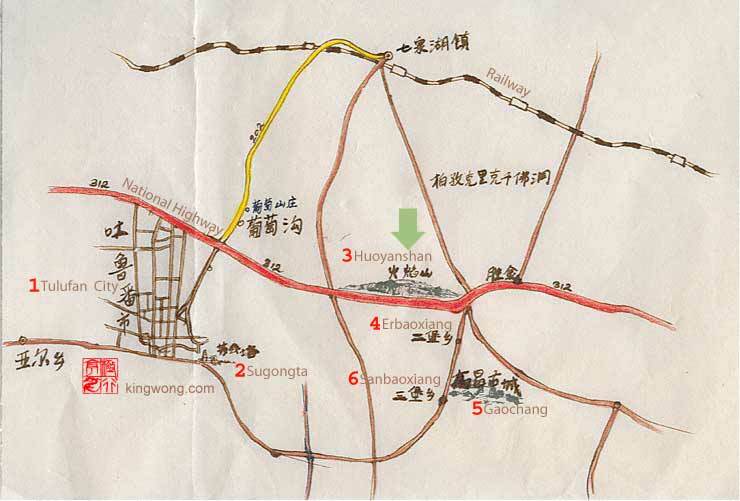 Not far to the left is 二堡乡 Erbaoxiang Township where the 高倡故城 Gaochang Ruins are. 1吴承恩著《西游记》，第五十九回之唐三藏路阻火焰山。 From Wu Chengen's "Records of the Westward Journey", chapter 59, entitled "Tang Sanzang's road block by the Flaming Mountains". Sanzang is the fictionalized figure of the Tang monk and traveler 玄奘Xuan Zhuang (602 - 664). The translations from the Chinese to English are my own. The largely fictional novel, which chronicles the westward journey of the historical 唐朝Tang Dynasty (618 - 907) monk 玄奘Xuan Zhuang (602 - 664), who made the treacherous trip to India to obtain Budddhist scriptures for studies, also provides a story on the origin of the Flaming Mountains: During the time when 孙悟空Sun Wukong (the Monkey Lord, the main character of the novel, who later became the disciple of the fictional monk) and his monkey armies rebel against Heaven. He creates unstoppable havoc. After numerous embarassing defeats, the heavenly forces finally catch the unconventional monkey. When all methods fail to execute the Monkey King, he is then place inside a furnace and burn continuously for 49 days. But just when he is thought to have turned to ash, he breaks out and knocks down the furnace, whereby some charcoals fall down to earth and became the Huoyan Shan. The local Uygur ethnic people has their own legend: It was said that a vicious dragon dwelled in the 天山Tian Shan mountains. And this monster has the horrible appetite for children's flesh. So a young Uygur hero got hold of a mighty sword and battled with the creature for some tireless days. 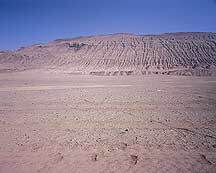 He eventually slayed the dragon and sliced it into pieces; the bloody remains of its body became the Flaming Mountains. I spent a couple of hours in front of these mountains when I was here. I walked a close distance to its base and set up my 4x5 on a tripod. Most of the time I was wiping sweat and checking out who else was out here baking other than the camels and me. For the 2 hours outside I felt the burning heat through my sneakers' sole, so I stood on one leg to cool off the other. A staff thought I might soon turned to charcoal, so he drove his rover up to me to see if I am ok. He offered me a ride back to the underground mall, but I declined. Before he left, he handed me a bottle of water and wished me well. There were a couple of things one can do here: to have a picture taken on top of a camel, or if you are really adventurous, you may hire a rover to climb up the hill. You may climb up yourself, of course. The view up there must be awesome. The main tourist part of the mountains, the one with the most gullies, are fenced. To enter, one gets a ticket and passes through an unbelievable underground mall (richly decorated with themes from the famous book) and spirals up a large hole and out through a small opening, and then be surprised by these phenomenal blazing red hills. In the center of this large hole was a huge thermometer in the shape of Monkey King's famous cudgel, and it pointed up against the sky. Bus ticket from 吐鲁番市Tulufan City to 火焰山Huoyan Shan (Flaming Mountains). Huoyan Shan is about 40 kilometers east of 吐鲁番市Tulufan City. The easiet way to get there is to hire a taxi (Y7-Y8) or a minivan, which will take you there in less than half hour; however, waiting for it to pool enough people may take longer. Tell the driver to drop you off at the tourist entrance. Bring lots of water. If you don't like the sun, bring an umbrella. And if you like to stand a little longer, wear shoes with thicker soles. 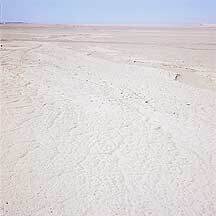 If you wander off far from the underground mall, be aware that there may be sandstorms. I have experienced a sandstorm in the highway near this area, although not in this same spot. While I was there, a staff on a rover asked if I wanted to get a ride up the hills, but I declined. You may climb up yourself or hire a rover to take you up. I don't know how far up the rover can take you. And I don't recall seeing any tourists hanging around up there.